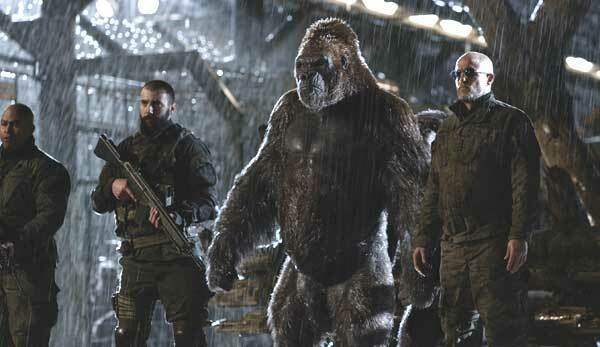 WAR FOR THE PLANET OF THE APES concludes the modern APES trilogy started in 2011 with RISE OF THE PLANET OF THE APES. An epic film doing its best to capture the immensity of a protracted battle between two species for the stewardship of a planet, it succeeds on many intellectual and technical levels, and falls slightly short in its visceral, emotive impact, and is probably too introspective for its own good. By that I mean, unlike a gorilla attacking a capybara, I couldn’t sink my teeth into it. It ends with a literal bang and a metaphorical whimper. WAR opens with an APOCALYPSE NOW sensibility; encumbered, weary soldiers trudging through heavy foliage, a helmet emblazoned “MONKEY KILLER” and – gorillas as aides! Apes helping humans ambush apes. To those viewers old enough to recall the mantra “Ape Shall Not Kill Ape,” this is the lowest of traitorous acts; as if to drive home the ignominy, they are called “donkeys” by the soldiers. Lush rainforest, spectacular cinematography, brutal aspect. A blistering firefight, as incendiary as the most violent war tableaux; apes on horseback, spears through human backs, explosions, gas grenades, soldiers shouting incoherently, mayhem, death and greenery. We meet Caesar the dominant chimpanzee (Andy Serkis in mo-cap) walking through trenches regally, apes parting as he moves through them. 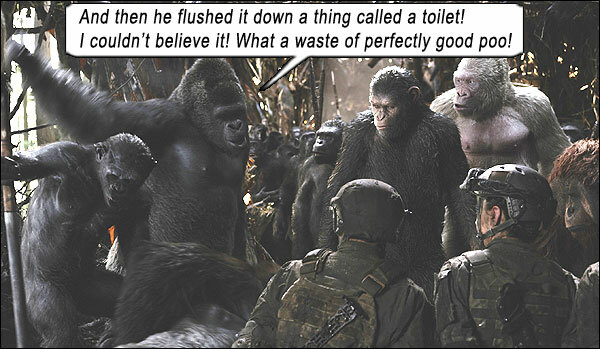 (And yes, Caesar is walking, fully upright – a conscious decision by the filmmakers that illustrates his arc toward civility, not because Serkis cannot, or is too lazy to, mimic apes, like tiny-minded productions KING KONG VS. GODZILLA or KING KONG LIVES. All other apes in this movie amble as apes do, swinging their bodies side to side.) Caesar is shadowed by his retinue, which includes orangutan Maurice (Karin Konoval) and a white gorilla named Winter (Aleks Paunovic). And only Caesar speaks. Fluidly, in full sentences, in a thoughtful rasp, while all other apes mumble certain words but “sign” for the most part, with subtitles, the filmmakers and actors never letting us forget they are apes, through their physique, bearing and movements. And flinging poo. This modern APES trilogy distinguishes itself from the original PLANET OF THE APES franchise (1968-1973) in that it has always been told from the perspective of the apes, whereas the original series was initially told from the human point of view, gradually pivoting to that of the apes’ viewpoint. Caesar’s family surround him, Cornelia (Judy Greer) and infant Cornelius. The whole society is mapped out, living quarters, families, pecking order – an amazing level of detail. Caesar’s son Blue Eyes (Max Lloyd-Jones) even has a crush – the female chimp, Lake (Sara Canning). Blue Eyes has returned from a recon mission, discovering a land beyond the desert where Caesar’s tribe can retreat to safety from the encroaching warring humans. (Our minds snap to “The Forbidden Zone” that Charlton crossed many melodramatic moons ago.) Winter is skeptical of the plan – and is glared down by Caesar for interrupting his son. Caesar’s closeups are astounding for their intensity; in his eyes we see the intelligence, wisdom, strategy and experience of a leader. WAR is arguably Serkis’s finest moment, as an actor and as a pioneer in motion-capture. It is a performance that can bring tears with its poignancy and fear with its wrath. And The Colonel (Woody Harrelson) inspires that wrath, leading his Alpha-Omega troops (allusion to BENEATH THE PLANET OF THE APES) on a night raid of the ape tribe, Caesar’s wife and Blue Eyes being killed in the attack. Cornelius is safe (thank goodenss! or Roddy McDowall would be out of a job), and Caesar sends him away with Lake and the tribe to cross the desert, while Caesar himself turns to pursue The Colonel’s regiment into the snowlands, vengeance in his heart. 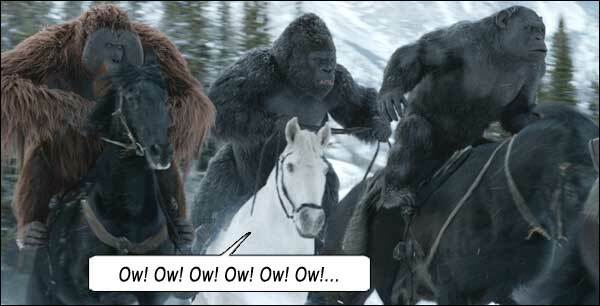 With Caesar: Maurice, chimp Rocket (Terry Notary) and gorilla Luca (Michael Adamthwaite), all on horses which I’m sure are plotting their own rebellion after breaking their backs on those 400-pound apes Luca and Maurice. WAR becomes a road movie, meandering in the snow. The apes come across a mute young girl (Amiah Miller), who is named Nova through Maurice noticing a Nova Chevy’s license plate, and Bad Ape (Steve Zahn, a jittery, bug-eyed opportunist and comic relief), who only knows himself by the name the humans called him. In this interlude: poignancy, as Luca – the most powerful of beasts – gifts Nova a flower; and sadness, as Luca is later shot down by humans, and Nova puts her flower back in his dying hand. Captured, Caesar comes face-to-face with Colonel, who, instead of simply gunning down this dissident, engages in Villain Talk, meaning Colonel tells Caesar his plans, his motivations, his Passover salmon recipes, and his star sign. It is Caesar’s obsession with killing Colonel that makes WAR seem more like a vengeance quest than a full-scale war movie. Maurice: “Your hatred for the Colonel is making you like Koba [the belligerent ape in DAWN with a hatred of humans].” This theme is alluded to more than once: “I cannot escape my hate – I am like Koba!” which might imply Caesar is “warring with himself”? Maybe. Or maybe the filmmakers got sidetracked with the vendetta because it provided an excuse for an antagonist. Colonel tells Caesar about the virus (originated in RISE) that renders humans “primitive, like an animal, by robbing us of those things that make us human, our speech, our higher thinking” – this explained Nova! – “turning us into beasts.” Dovetailing with the 1968 movie, the cogs grinding closer to wrap this series into the original franchise. Not only does Colonel simply kill his own men stricken with the disease, he wants to wipe out the apes before they can inherit the Earth. And his star sign is Capricorn. The virus hits the Colonel, and Caesar stands over him: the beast-become-humane standing over the man-become-beast. Death through irony. Then, in its final moments: war scenes that shudder with Pretty Orange Explosions and wrack us with their poignancy; sacrifice and RPGs, armies and avalanche. Written by Mark Bomback and Matt Reeves, directed by Reeves (who were both involved in this movie’s predecessor), WAR retains a firm continuity with RISE, both films reflecting the same somber tone. As Caesar becomes more prominent, his power and influence growing, he takes on the congruent amount of responsibility, and his brow furrows all the more for the burden. His story – like all great leaders – would end in sadness, that he could not do everything he set out to do: Like Charlton Moses, Caesar would see his people enter their promised land, but will not be able to enter himself… as Maurice notices the arrow wound in Caesar’s side. He sheds a tear, casts his gaze over Caesar’s tiny son. Maurice mouths the words, uncomfortable through his untrained vocal cords: “The son will know who his father was, and what Caesar did for us.” The son – Cornelius. We have circled back to – if not exactly canon, then – legend. Now to find a cheese-maker as tall as Charlton. Writers: Mark Bomback, Matt Reeves, Rick Jaffa, Amanda Silver, Pierre Boulle. Starring: Andy Serkis, Woody Harrelson, Steve Zahn, Karin Konoval, Amiah Miller, Terry Notary, Ty Olsson, Michael Adamthwaite, Toby Kebbell, Gabriel Chavarria, Judy Greer, Sara Canning, Devyn Dalton, Aleks Paunovic, Alessandro Juliani, Max Lloyd-Jones, Roger Cross.